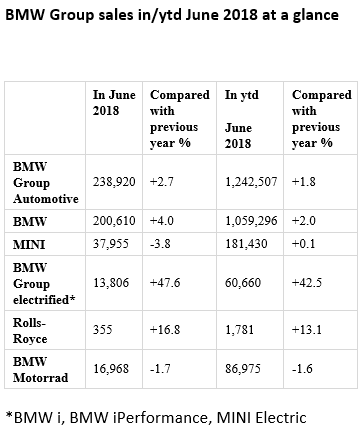 June deliveries of BMW i, BMW iPerformance and MINI Electric vehicles totalled 13,806 vehicles worldwide, an increase of 47.6% on the same month last year and the highest monthly total ever for BMW Group electrified. Year-to-date sales of electrified BMW and MINI vehicles totalled 60,660 (+42.5%), confirming the BMW Group’s position as a leading global provider of premium electrified mobility. “We can see how well customers respond in markets where electromobility is supported by a range of measures,” commented Pieter Nota. “For example, three quarters of the vehicles we sell in Norway are electrified, while one in three BMW 5 Series delivered in California is now a plug-in hybrid.” With the introduction of the locally-built BMW 5 Series plug-in hybrid (fuel consumption combined: 2.3-2.1 l/100 km; electricity consumption combined: 14.1-13.1 kWh/100 km, CO2 emissions combined: 52-47 g/km) in China, electrified sales in the BMW Group’s largest overall market have increased five-fold in the first six months year-on-year, with a total of 6,295 units sold so far in 2018. First-half-year electrified sales increased significantly in several other major markets, including the USA (12,015 / +51.3%) and the UK (8,823 / +41.4%). The BMW brand sold more than 200,000 vehicles for the first time ever in June, growing sales 4.0% in the month to total 200,610. Sales in the year-to-date are up 2.0% with 1,059,296 vehicles delivered to customers worldwide in the first half of the year. All major sales regions contributed to this growth. 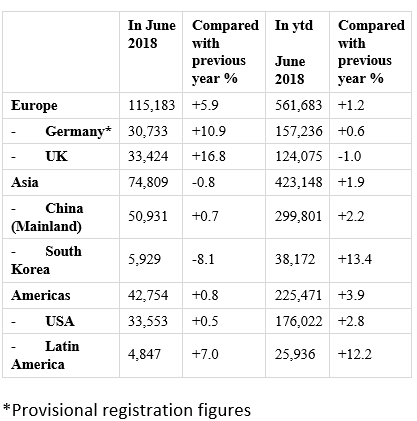 A range of models contributed to the sales increase in the year-to-date, including the BMW 1 Series (98,396 / +7.2%), the BMW X1 (152,866 / +11.8%) and the BMW 5 Series (191,185 / +14.9%). Thanks to its improved availability in June, the BMW X3 achieved a 24.6% increase in monthly sales, with a total of 17,584 units delivered. First half-year sales at MINI achieved the same high level as last year, with a total of 181,430 (+0.1%) vehicles delivered to customers worldwide. MINI deliveries in June were down 3.8% (37,955). Sales of Rolls-Royce motor cars in the first half of 2018 were up 13.1% (1,781) year on year. Demand for all Rolls Royce models remains strong in most regions, including positive momentum in China, however market conditions in the Middle East remain unsettled. In addition to excellent sales of new Phantom, demand for Black Badge variants of Dawn, Ghost and Wraith continues to surpass expectations. The new Rolls-Royce Cullinan was unveiled in May to great acclaim and already has a strong order book stretching well into next year. First customer deliveries of the new all-terrain model are due in the first quarter of 2019. The process of adjusting all BMW models to the new WLTP testing process is going to plan and the vast majority of models have now completed the retesting cycle. In addition, around 190 models already fulfil the Euro 6d TEMP emissions requirements, which only become compulsory from 1 September 2019. These models include petrol, diesel, BMW i, BMW iPerformance and BMW M vehicles. “We’re now able to offer our customers in Europe a broad range of models which not only have the WLTP type-registration but also already fulfil the Euro 6d TEMP emissions standards,” said Pieter Nota. Deliveries of BMW Motorrad premium motorcycles and maxi-scooters in the first half of the year were close to the extremely high level achieved last year. In the year-to-date, a total of 86,975 units were delivered to customers, a decrease of 1.6% year-on-year. BMW Motorrad is significantly refreshing its model line-up in 2018, with nine new models being introduced, and the related adjustments in production are affecting deliveries. BMW Motorrad continues to strive for sales growth across the full calendar year. 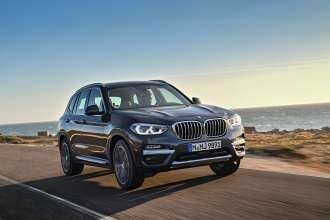 All three major sales regions contributed to the BMW Group’s first-half-year increase in sales. In Europe, the BMW Group achieved good growth in many markets and BMW was the most popular premium brand in several countries including the UK, Belgium and Austria. BMW Group deliveries also increased in the Americas, where all markets recorded growth in the first half of the year, with BMW the leading premium brand in Mexico and several other Latin American countries. Sales also grew in Asia in the first six months of the year with several important markets, including South Korea and India, achieving double-digit growth.